LawWare will be exhibiting at Law2018 Leeds on the 6th and 7th March at the Met Hotel. 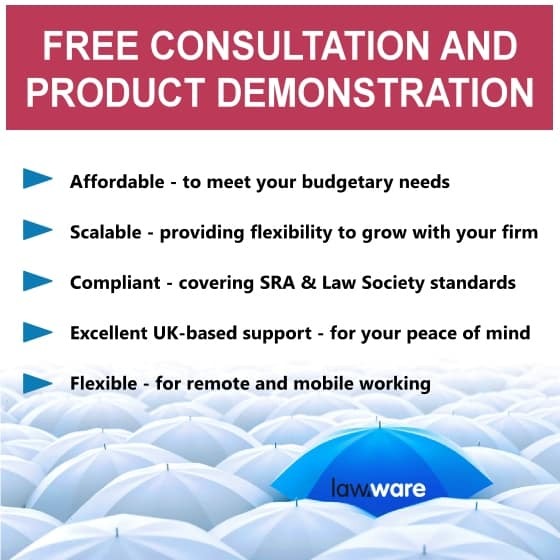 If you are able to, please take the time to visit us on Stand 16 and we will offer you a free product consultation and software demonstration. Get up-to-date with 2 days of quality educational content from leading speakers. Network with over 350 legal professionals. Meet with the profession’s leading suppliers and take advantage of the special offers available to you and your firm. Book your CPD conference or FREE exhibition ticket by calling 01332 226601. If you are a supplier to the legal profession, talk to us about featuring as a sponsor or exhibitor by calling 01332 227682. Leeds city centre is only one mile from the M1, M621, or M62. Please note there is limited spacing on-site which is allocated on a first come first served basis, the hotel suggest exhibitors park at the nearby NCP car park. Take Junction 43 off of the M1 onto the M621, then exit at junction 3 signposted for Leeds City Centre and Holbeck. Following the signs for City Centre, continue along and under the viaduct. At the second set of traffic lights turn left and get into the middle lane. Go straight through the next lights with Majestyk’s Nightclub on your right, on to Wellington Street. Turn right at the small traffic island onto King Street. The hotel is on the right hand side. Take junction 27 off of the M62 onto the M621. Then exit at Junction 3, signposted Leeds City Centre and Holbeck. Then follow the directions above. Follow signs for City centre, take a left turning signposted International Pool onto Wellington Street (Yorkshire Post building is on the right). Follow the road as far as it will go before you have to turn left. The hotel is on the right hand side. Nearest station: Leeds City Station (the station is a two minute walk away). Leave by the station’s main entrance and turn left. Follow to the traffic lights and turn left again. Cross over at the next pedestrian crossing. Go down the left hand side of Majestyk’s night club. Take the second right after the Wharf Street bar, on to King Street. The hotel is on the right hand side. A free city bus goes from the bus station and stops opposite the hotel on King Street. Nearest airport: Leeds Bradford international airport. The airport is 11 miles north, a 25 minute taxi ride from the hotel (costing approximately £15). Manchester International airport is a 90 minute drive by car. A train goes direct from the airport to Leeds City station. Please click this link to order your tickets.